Need help getting organized? Step up to the 45 Gallon Wheeled Latch Tote, which is equipped with wheels, making it the ideal portable solution, even for heavier loads. Contain and conceal sporting gear, camping supplies, bedding, seasonal items and more in this large capacity tote. 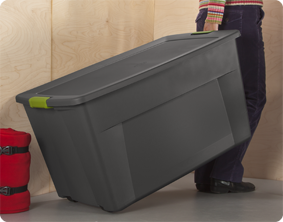 Durable construction and contemporary styling make this a great solution for storing household items away in the garage, basement or attic. 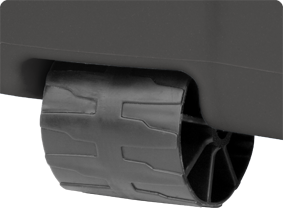 Heavy duty latches ensure lid remains securely attached to the base, keeping contents safely stored inside. Multiple totes are able to stack neatly on top of each other; and contoured end panels create a surface for comfortable lifting. The overall dimensions for this item are 36 5/8" x 21" x 19 1/2". Overall Assembled Size: 36 5/8" x 21" x 19 1/2"
Wheels make moving the tote easier, even heavier loads! Need a way to store all your outdoor furniture pads and covers? 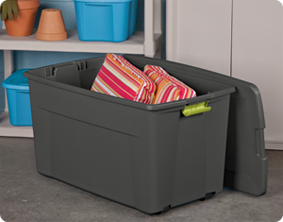 The large capacity design of this tote will make organizing and storing those items easy, and will keep them dust free and protected until next season. Wheels make transporting easy to and from the garage or shed. Moving soon? 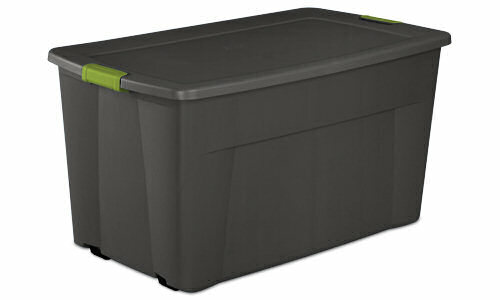 The large capacity of these totes makes packing larger items easier and helps protect them during the move. 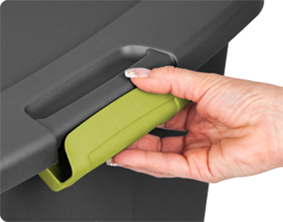 Latches secure lid to base keeping items safely stored inside. 45 Gallon Wheeled Latch Tote is rated 4.6 out of 5 by 22. Rated 1 out of 5 by erniep10 from Dont buy this junk Used my wheeled tote for first time carrying it on a trailer hitch rack. Wheels melted and bin became disformed. It states "Industrial."... dont believe it. Rated 5 out of 5 by TruckeeSusan from This tote is a lifesaver in storing and moving items Love using this tote. The wheels make it so much easier to move and helps save on chiropractic bills. The durability is great. I can't tell you how many fingernails I have broken from totes that are difficult to open or ones that crack over time. This wheel latch tote is a dream come true. Thank you Sterilite. Rated 5 out of 5 by Christmas variety from More variety. I love the 45 gallon red with red latch - I wish you made an all green 45 gallon as well (I would have bought 4 more - too bad). Rated 5 out of 5 by SUZ from I love that it rolls! Large totes like this one are usually very cumbersome to move around. I love that it has a pair of wheels. I always push the limits of products. I am going to try using it as a movable raised garden bed. I'll send the results when I've tried it. Rated 5 out of 5 by A100raquel from Great for storage I use this tote to storage all my Christmas decoration and every year it comes out clean and in great condition. I also use them to keep my winter clothes clean and safe! Rated 3 out of 5 by jwb from Not a very reliable product. The lids on these totes have an issue of collapsing into each other when they are stacked on top of each other over time. Contacted Sterilite about getting replacement lids and they told me its cheaper & a better deal to just buy new ones. Rated 4 out of 5 by optivisor from convenient wheels Not as sturdy as the footlocker, but nice with lots of space. It is so convenient to roll the box instead of trying to carry it. Great idea! 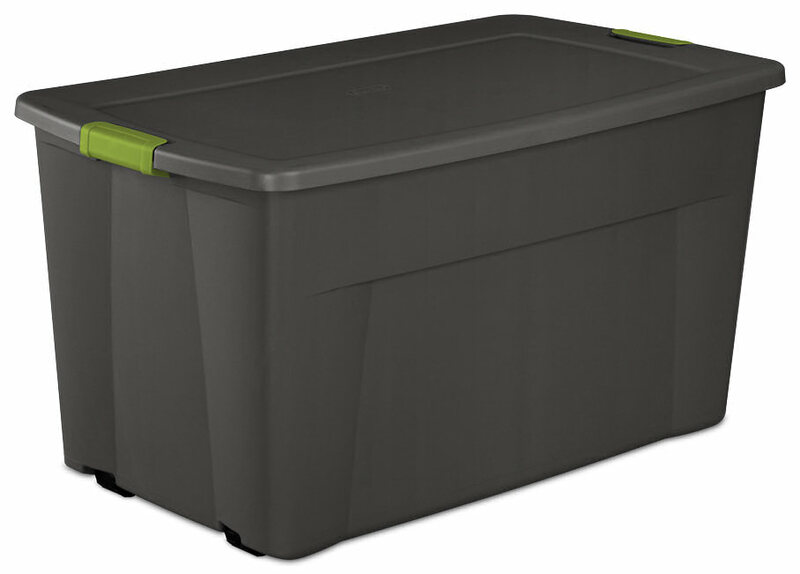 Rated 5 out of 5 by PZSunshine from The 45 gal wheeled tote is perfect for storing decorations! I purchased an orange 45 gal wheeled tote at Halloween last year. I love it but need more. Now I would like to purchase some in Red or Green for Christmas decorations. I wish these totes were sold in multiple colors all year long. Are the colored ones only manufactured and sold during specific seasons?